Pregnancy Tea, a mixture of nourishing herbs that are packed with vitamins, minerals and phytonutrients. Some herbs, like nettle and alfalfa, are good well-rounded herbs that general wellness, and others, like red raspberry leaf, are particularly valuable for pregnant women. I’ve always enjoyed making herbal teas for my family, like this sleepy tea. When I learned I was pregnant with our second child, I felt giddy and excited and stunned. More than anything, I wanted to nourish myself and strengthen my body for the rigors of bearing another child, particularly since there’s a span of nearly eleven years between my first pregnancy and this one. I reached out to a team of local midwives, and in addition to mindful eating during pregnancy, they recommended drinking an infusion of red raspberry, nettle and a few other herbs daily during my pregnancy. Pregnancy tea recipes typically rely on two herbs: nettle which serves as a good general tonic and red raspberry leaf which has been used in herbal medicine for pregnancy and birth for many mothers of many generations. Beyond these two, other herbs that are safe for pregnancy lend benefit, too: mineral-rich oatstraw and alfalfa, rosehips for their vitamin C and others. They each convey deep nourishment not only in the form of vitamins and minerals, but also in other active compounds. Pregnancy tea isn’t strictly an herbal tea; rather, it’s an overnight infusion. 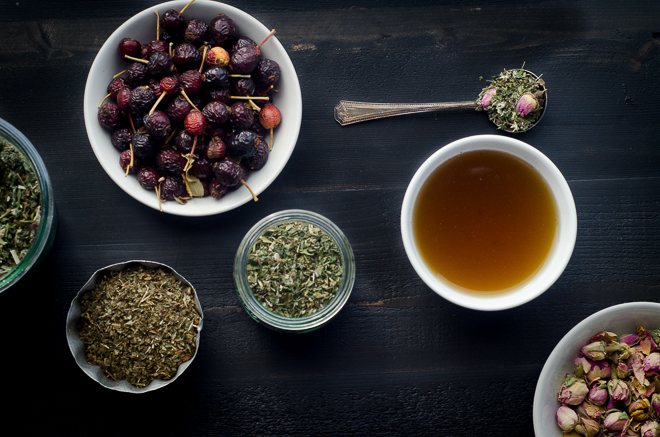 Light in flavor, most herbal teas are steeped only for a brief period of time. But when you’re after real and concrete nutrition from those herbs, you want to extract as much goodness from them as you can. Overnight infusions, in which herbs are steeped for hours as opposed to a few minutes, do just that. 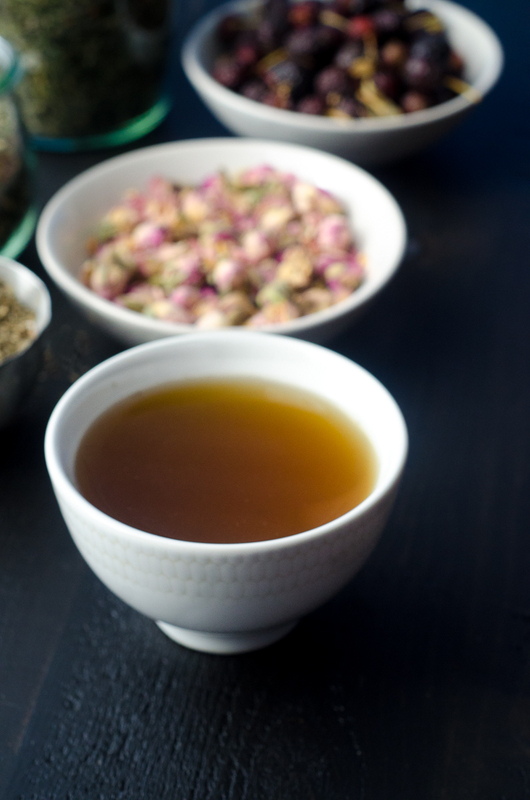 The extended time allows the water to extract more nutrients from the herbs than a short steeping, as a result this pregnancy tea is fuller and stronger in flavor, and more nutrient-dense than a tea might by light steeping. As with anything, the quality of your source matters. For my part, that means ethically sourced and organically grown. Those of you who garden or who can forage might be able to source most of these herbs from your own backyard, dry them yourselves and make tea. You might also find a few of these herbs in a well-stocked health food store. I favor buying my herbs here in bulk, a source I’ve used for years. Red Raspberry Leaf boasts a celebrated place in traditional and folk medicine for its use as an herb for women, and, specifically, during pregnancy. Herbalists note that red raspberry leaf acts as a uterine tonic, and it is used in folk medicine to not only prepare the body for birth, but to shorten labors. Renowned herbalist, Susun Weed, notes that red raspberry leaf acts to tone the uterus so that, during labor, contractions work more effectively, making birth easier and faster (source). A study undertaken in Australia seems to support this idea; moreover, women who consumed red raspberry leaf tea during their pregnancy were less likely to receive interventions like C-sections, forceps or vacuum-extraction births than women who did not consume the tea (source). Another study found that women who consumed red raspberry leaf during pregnancy were less likely to have forceps-assisted birth; moreover, it seemed to shorten the amount of time they spent pushing by ten minutes (source). While researchers didn’t find that ten minutes less time spent in the second stage of labor was a significant outcome, most pregnant women, myself included, might disagree – thankful for even ten more minutes of relief. The use of red raspberry leaf in early pregnancy is debated among herbalists, with some recommending it and others not. As with consuming anything in your pregnancy, you should reach out to your care provider. Nettle leaf is a tonic herb thought to strengthen and tone the entire system, and is particularly useful as a to support fertility in both men and women (source). In traditional herbal medicine, nettles are thought to ease leg cramps, and possibly ease the pain of childbirth (source). Nettle is particularly rich in micronutrients like carotene, vitamin C, manganese, iron, calcium, zinc and chromium. As the mother passes anything she consumes to her baby both during pregnancy and breastfeeding, nettle will not only nourish her body, but also her growing baby. After birth, nettle is thought to promote an abundant milk supply (source). In addition to nettle tea, you can use fresh nettles (be wary of their sting) in your cooking and reap their benefits there, as well. In springtime when young, wild nettles are plentiful, I make Nettle Omelets and Nettle Soup (recipe in my first cookbook). Oat straw was traditionally used in Europe as a tonic for health, beauty, and emotional resilience. It’s rich in both calcium and magnesium. Calcium and magnesium work together in the body, with calcium stimulating muscles to contract and magnesium relaxing them. In this way, it’s thought by herbalists and midwives that oatstraw can be particularly valuable for pregnant women. Calcium tones the muscles and the cardiovascular system, and improving circulation both in the mother’s body and, naturally, to her baby as well (read more here). Magnesium then, by contrast, helps those muscles to relax, easing cramps, restless legs, as well as improving sleep. Alfalfa, like nettle, is a general restorative herb. In folk medicine, alfalfa is used to support thyroid health (source) and it’s thought to ease morning sickness. Alfalfa, like nettle and red raspberry leaf and other green leafs, is also rich in vitamin K which supports healthy circulation and proper blood clotting. Low vitamin K levels is linked with bleeding and hemorrhage which may be why many midwives recommend optimizing your vitamin K levels during pregnancy, particularly in the weeks leading up to childbirth, with the primary recommendation beeing diet as well as herbs like alfalfa (read more here). Alfalfa hay is also given to livestock to help them produce abundant milk, and is thought to convey the same benefits to human mothers as well. I add both lemon balm and rose hips to my tea for their flavor more than anything else. This pregnancy tea tends to be inky and dark, owing both to the heavy use of leafy green herbs like nettle, alfalfa and raspberry leaf. Both lemon balm and rose hips, bright in flavor, aromatic and astringent, lighten the tea in a pleasant way. Lemon balm gives this pregnancy tea delightful, mellow lemon-like flavor. In traditional, folk medicine, lemon balm is used for nervousness, digestive upset, and headaches (source). Similarly, rose hips bring a light and pleasant tartness to the tea. Rosehips are rich in bioflavonoids and vitamin C, and it’s that vitamin C that works synergistically with iron to help your body better absorb that mineral. Similarly, rose buds bring pleasant floral notes and a lovely feminine energy to the tea. This traditional pregnancy tea is rich with dark, leafy herbs like Red Raspberry Leaf, Nettle and Alfalfa. Lemon balm and rose hips lighten the inky brew with their bright flavor. You can purchase all the herbs. 2 ounces nettle leaf Buy it here..
2 ounces raspberry leaf Buy it here..
1 ounce oatstraw Buy it here..
1 ounce alfalfa leaf Buy it here..
½ ounce lemon balm Buy it here..
½ ounce rose hips Buy it here..
½ ounce rose buds Buy it here..
Stir all the herbs together in a large mixing bowl so that they're evenly distributed. Set a wide-mouth funnel (find one here) into the lip of a jar and spoon the mixed herbs into the jar. Cap tightly and store out of the sun. Bring about a quart of water to a boil, and then spoon a heaping quarter-cup (about ¼ ounce) of your mixed herbs into a quart-sized jar. Cover with boiling water, cap, and let them steep overnight - about 8 hours. Strain out the herbs, and enjoy the tea. Among the midwives who recommend pregnancy teas, like this one, most recommend about two cups a day during the second trimester and up to a quart a day in the third trimester. Reach out to your care provider to determine what is the right amount for you. In reading over the pregnancy tea recipe, I am confused as to the amount of mixed herbs to steep in a quart jar overnight. Your recipe says “spoon a heaping quarter-cup (about 1/4 ounce) of mixed herbs into a quart jar. Quarter cup is 2 ounces, not 1/4 ounce. Can you clarify? You’re confusing fluid ounces (a measurement of liquid volume) with ounces (a measurement of weight). So 1/4 cup is equivalent to 2 fluid ounces (both being volume measurements), but depending on what’s being measured it may weigh more or less than 2 ounces. 1/4 cup of this tea weighs approximately 1/4 ounce. Would this tea also be good for menopausal women (to balance hormones) who are also trying to build bone density (for the calcium)? The truth is that I’m not familiar enough with herbs or the needs of menopausal women to make a recommendation a this time. I would recommend that you speak with an herbalist about determining which herbs would be appropriate for menopause. Susun Weed’s The Menopausal Years would be a great resource for anyone looking for herbs for menopause. According to reviews for red raspberry pregnancy tea on another herb website, the tea is excellent for menopause and for balancing hormones. And according to that website also, oatstraw is high in both natural calcium and magnesium; both are needed for proper calcium absorption. When you see ounces listed by dry ingredient (or just ounces listed at all) that means the measurements are by weight. The ounce is a measurement of weight, not volume. If you see fluid ounces, that is a measurement of volume. Thank you for this recipe. I’m entering the third trimester of my second pregnancy. I’m intended on a VBAC and am prepping my body and mind for the birth. I love how this recipe is laid out and the benefits of each herb that you’ve highlighted. Best wishes for your pregnancy and upcoming baby! Congratulations on your pregnancy!! I used these herbs throughout my 3rd and 4th pregnancies over 20 years ago. Those two children had the most beautiful white and fairly straight teeth. Those deliveries were my easiest. My two oldest had very stained teeth and that was probably due to my own health and the deliveries were more difficult. So happy to hear the tradition continues. Bessings on the birth of your baby at it’s appointed time. Maybe you have already had it. I am a little late on this post. So happy for you ! I love your blog and your cookbook! Could I drink this tea while nursing as a milk aide and post natal? Thanks!! I’m drinking this postpartum as uterine tonic and because nettle and red raspberry leaf are just some really good herbs, all around. If you’re looking for a tea to boost milk supply, I’d recommend this one: http://www.traditionalmedicinals.com/products/mothers-milk/. Thanks for your comments and recipe re. Pregnancy Tea. Do you suggest powdered or cut pieces of rosehips for the recipe? Can the pregnancy tea used for overall health even if you are not pregnant? I love all the ingredients and want to make sure it would be benefinicial for normal use. It’s a good general tonic for women. I have been adding peppermint to raspberry and nettles. Do you know if pepperment has any negative affect on the other two? Like blocking or reducing its absorption. It was a question that popped in my this morning. Might be silly but I always wondered about blending teas. How long will this brew keep in the refrigerator? I kept it about 3 days before brewing another batch, but I also drank it quickly. Thank you for the recipe and all the links. I ordered and received all the ingredients to make the tea. Just curious why it has to steep overnight? Usually when I make other teas it is for a few minutes? This is less a tea and more an infusion, so the extended steeping allows for the full medicinal value of the herbs. So you only drink this during the 2nd and 3rd trimesters? Why not the 1st? Thanks!! My midwives recommended it in all three trimesters. Some herbalists recommend against RRL during the first trimester. What does “RRL” stand for? Thanks! Thank you for sharing this recipe Jenny! I love that you included rose hips and buds! Such a lovely twist on the boxed pregnancy teas. Did you find that that this helped you have a “shorter” labor? I had a CRAZY short labor, Lisa. It was about 4.5 hours total, and I didn’t spend any time in the second stage, my body just expelled the baby spontaneously in about 2 or 3 rapid contractions. How much should you consume during the first trimester? Some midwives recommend against it in the first trimester, other midwives recommend it in the first trimester. I would recommend talking to your health care provider. I know this is an older post, but I am wondering what your knowledge is regarding this article, http://drbrewerpregnancydiet.com/id86.html, which is very thought provoking about the DANGER of using any herbs in pregnancy that can be used as diuretics (alfalfa, nettle, dandelion, etc.) & the fact that such herbs can cause an imbalance of water & blood volume, leading to complications? Are you a maste herbalists or do you know one who could confirm or deny this information? I think that post is unnecessarily and ridiculously alarmist and that it is further emblematic of the absurd, culturally-based restrictions we put on pregnant women’s dietary choices. These herbs and this tea is recommended by most midwives, including mine, and every single herbalist I’ve spoken to. There is one area of debate and that is the use of RRL during the first trimester, and so women should certainly consult with their caregivers, but the article you linked to is really outlandish in its pearl clutching. Women should use herbal teas in moderation and in consultation with their health care provider, and these herbs are well-known as tonics for pregnancy. TY for your input :). Just curious, the directions say to pour the boiling water over the herbs in the jar. Have you ever had an issue with the jars shattering? Also, if adding honey, do you think it’d be better to add it while the water is still hot, or after the herbs have been filtered out? No, I’ve never had an issue with a jar shattering. I recommend mason jars, and as long as they’re not cold when you add the hot water, they shouldn’t shatter. I don’t really add honey, but if I did, it would be after the herbs have been filtered out. My goodness, this was a beautiful project to work on! Therapeutic in preparation and consumption. Thank you for sharing your knowledge. Hello! This was very helpful! My midwives advises me to begin making a brew daily of oat straw, alfalfa, nettle, dandelion leaf & red raspberry and drink 4 cups per day. I’m at the first week of my 3rd trimester. How many oz of herbs do I need for the recipe? It sounds like a lot to me but I’m not familiar with buying herbs online & im thinking of using the website you posted about in this article. Also, is it something you make daily or you could make a couple jars at once for multiple days?